The latest update in this series of reports summarises the trends which were on show at the European yarn fairs for the spring/summer 2019 season. The author of the report visited Première Vision Yarns and Pitti Immagine Filati where she interviewed exhibitors and found out first-hand which trends were proving to be the most popular. 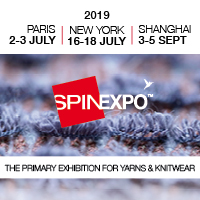 The European yarn fairs for spring/summer 2019 were once again held in a positive mood, despite economic uncertainties affecting the whole textile and fashion industry. Natural fibres including cotton, linen, silk and wool were prominent at the fairs, and there was a trend towards a rustic look. By contrast, there were also several yarns incorporating natural fibres which had been treated to provide performance properties. The range of fancy yarns on display was diverse, and metallic details were a key trend. There was a strong focus on environmental sustainability, and a number of spinners offered yarns incorporating organic or recycled materials. In particular, several spinners were making use of cupro and polyester made from polymer derived from recycled materials.